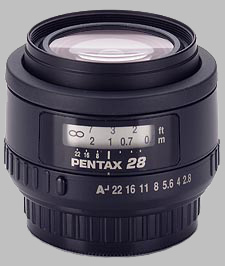 (From Pentax lens literature) The Pentax SMC P-FA 28mm f/2.8 AL wide-angle lens offers outstanding flexibility and is ideally suited for architectural and landscape photography. It features an aspherical lens element to help transmit the light more efficiently through the lens to the film. Compact and lightweight, it measures 2.5" x 1.6" and weighs a mere 6.5 ounces. Like all Pentax lenses, the SMC P-FA 28mm f/2.8 AL is treated with the acclaimed smc coating for maximum light transmission, sharp definition, and high contrast while minimizing flare and ghost imaging. Would like an f/2 or f/1.7 to replace normal 50 from film. This is a great little lens and has become my defacto indoor lens around the house. Its slightly wider than "normal" on a dSLR which offers a great perspective and FOV. AF is fast and accurate, MF is difficult, the ring just isn't made for it. My only complaint is that I would like it a bit faster - 2.8 is just not quite fast enough for a low light normal lens. Would like to see an f/2, 1.7 or even 1.4. I highly recommend picking one up.